The physical address is 13 Augsburg Road, but please don't use this way of finding us. I don't think there's one sign that says Augsburg Road, and all our neighbours for three doors down (and that's quite a long way by European postal code standards) are also number 13. And then, on some municipal accounts Saint du Barrys appears as number 11. So the physical address is not an exact science. But it's easy to find us. Most folk arrive from the N7. There's only one road into Clanwilliam from the N7, and we're on it. Just keep going, don't turn right into the main road, and we're just after the bowling green, on the right, with the orange orchard on the left. There are brown boards all the way to the gate. 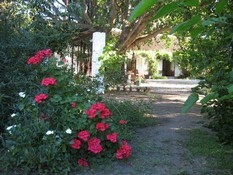 Clanwilliam is in the centre of the spring flower region. During the season there are flowers all the way from the beginning of the West Coast, up to Namaqualand. Clanwilliam is pretty much in the middle of this. Clanwilliam is the heart of the rooibos industry. Originated and developed locally, rooibos is now exported internationally. This is the only area in the world in which rooibos grows. I have yet to find out exactly which climatological factors contribute to such a unique occurence. At Saint du Barrys, we've had the pleasure of having many guests en route to and from Namibia. One of our long-standing guests hails from Windhoek, and in summer, he drives the entire distance between sunrise and sunset - in fact quite some time before sunset - from Windhoek to Clanwilliam. Perhaps this hint is illegal but here it is: on those long, long stretches of straight road in Namibia, you can push the limits by setting cruise control at 155 km. Up to 159, you get fined, at 160 you get fined and jailed. I haven't tried this for myself. Travel west from Clanwilliam, and you'll reach Graafwater in thirty kilometers, and stop at Lamberts Bay after sixty. Many of our guests do this, heading for Bird Island to see the colony of gannets achieving the impossible: finding offspring that look exactly like all other offspring without even trying. They leave a little runway open for take-off, but land anywhere. The noise-level is high, often the olfactory index, too. Head east, and you'll soon be up in the Cederberg, where you'll pass Bushmans Kloof, unless you have the good fortune to be booked in. This is one of the top ten resorts in the world. Here's what we love to boast about: their fresh produce is sourced by Mike Shaw, who delivers to Saint du Barrys as well. Perhaps we should consider raising our rates. At the Englishman's grave, there's a junction. Turn left to go to Calvinia, or right to go on to Wuppertal. From Wuppertal on, you'll need a four wheel drive vehicle, otherwise you'll have a good chance of getting stuck. The terrain is rough, and sandy. That's where we are on the planet. Two hundred and twenty kilometers north of Cape Town. At the foot of the rugged Cederberg. Sixty kilometers from a cold Atlantic coast. Sixty-two meters above sea level, in our parking area. Three hundred to Springbok, and after that, another one hundred and eighty to the Namibian border, with Vioolsdrif on the southern side and Noordoewer on the northern side. In South Africa, on the open road, you should easily average a hundred kilometers an hour, unless you're stuck behind a truck or negotiating a pass. This makes it fairly easy to estimate how much time it takes to get to where you want to be. If your vehicle has a sixth gear, you won't need an autobahn before you use it. To find the heart of where you are, once here, stand stock-still and blend into the ground, air and breeze, if there is one. Pretend you aren't here, but still keep your awareness open and present. You shouldn't need more than a few moments. Forget about the mad politicians, impossible global fiscus and whatever else distracts us from the earth beneath our feet, the vista in front of our eyes and the many-tongued air that breathes on our skin. You might well feel something you have never felt before. You won't be able to pack it into your suit-case, yet you will never leave it behind.